uuid : b43b36f9-cff6-4b7b-96d7-af853226cf35 templates_id: 119459 templates_uuid: "88274ef5-bead-458a-8a15-95d2815fd2be" title: "Consultancy Agreement Template - Contractor Agreement" display_name: "Consultancy agreement" meta_keywords: "Contractor agreement, Services agreement, Consultancy contract, Consulting services agreement and Consulting agreement" description: "
Whether you\'re engaging a consultant or you\'re being engaged as a consultant make sure you put things on a formal footing with this consultancy agreement. This simple consultant contract will make certain that both parties are clear on the services to be provided by the consultant as well as payment obligations. This consultancy contract will also protect you and your business on crucial issues such as ownership of intellectual property created by the consultant and data protection matters. A consultancy agreement is a contract between a self-employed person (consultant) and a customer requiring the consultant\302\222s services. Consultancy services are wide ranging and include advice from experts in certain areas eg brand consulting or the services of an independent contractor, such as freelance designer. Do I need a consultancy agreement? You will need a consultancy agreement when you hire a consultant and when you want to set out the details of your arrangement. Rocket Lawyer\'s consultancy agreement sets out all the terms of the arrangement such as the amount of time a consultant will spend on the project, how much they will be paid and contains clauses on confidentiality and ownership of IP. This contract will ensure that both client and consultant are legally protected. What is the difference between a consultant and contractor? 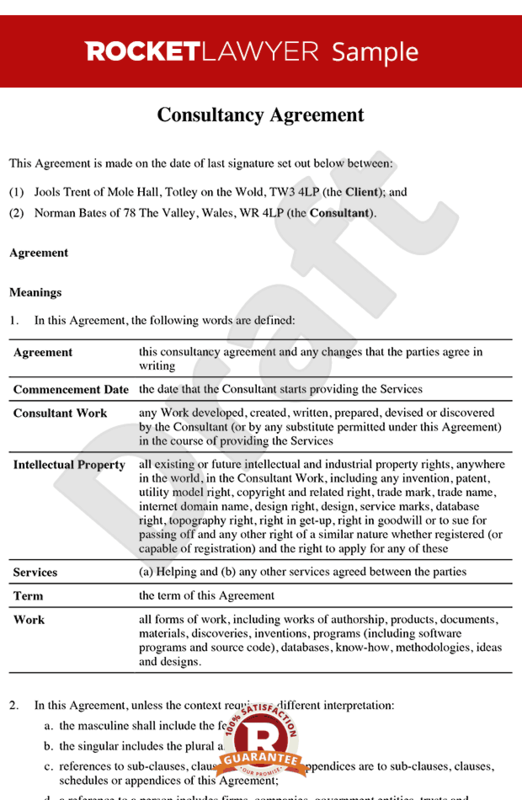 Rocket Lawyer\'s consultancy agreement can be used for both consultants and contractors. A consultant provides expert knowledge in return for a fee. They tend to work in an advisory capacity and are usually some of the most knowledgeable people in their chosen field. Consultants tend to work in specialist industries, such as finance and technology and provide businesses with professional, expert advice. A contractor on the other hand, provides a specialist service in return for a fee. Contractors are used by organisations that wish to acquire a given skill set for a period of time, but which do not want to employ someone permanently. Unlike a consultant, a contractor will actually carry out physical work, although they may also advise on what that should be beforehand. The types of work they undertake includes IT maintenance and support, cleaning services and security services. A consultant is not an employee or a worker. A consultant provides services on self-employed basis as an independent contractor or freelancer to a client company. Why is it important to distinguish between employee and consultant or independent worker? It is important to distinguish between an employee of a company and a consultant who provides services for your company. Consultants are not protected under employment law and are responsible for paying their own taxes. The relationship between a customer and a consultant is simply contractual and subject to less statutory regulation than employment contract. Employees are protected by a bundle of statutory employment rights and are paid through PAYE. This agreement clearly indicates that this is a contract for services and that the consultant is an independent contractor. Is the consultant allowed to work for competing businesses? The customer can choose if they will allow the consultant to work for competitors during the term of the agreement. The risk of creating an employment relationship if the consultant works for only one client is high. Allowing the consultant to work for others helps to avoid the risk of employee or worker status. What are the consultant\'s obligations under this agreement? Under this agreement, a consultant is required to perform services using reasonable care and skill and to the best of their ability. A consultant must report the progress of any projects and attend any meetings, comply with law, regulations and policies and procedures that are reasonably requested by a client. This agreement allows you to specify the minimum amount of time a consultant must spend in order to perform the services for the client. Can the consultant get someone to do the work for them if necessary, if they are unavailable? In this document, it is possible to choose whether a consultant can send a substitute in their place. If the nature of the services provided can be replaced, it is recommended that customer allows their consultants to find someone else to replace them in order to avoid accidentally creating employment relationship. How is a consultant\302\222s liability limited? A consultant is liable and has to indemnify the customer, for any loss, liability, costs, damages or expenses arising from a breach of duty or negligence. You can choose to limit this liability to a maximum amount or the total amount paid by the customer. However, in practice, liability limits can be difficult to enforce, especially if the client is a consumer. Therefore in this agreement, the consultant is required to have in place adequate insurance. How can this contract be terminated? How is the customer\'s confidential information protected under this agreement? This agreement specifies the types of confidential information the consultant may be exposed to, such as customer lists and business plans. A consultant is restricted from using, disclosing or allowing the use or disclosure of such information, without the client\302\222s prior written consent. The consultant must return or delete any confidential information when the agreement ends. The customer is also under the same obligation of confidentiality regarding the consultants confidential information. Who owns any intellectual property created by the consultant? This document expressly sets out that any intellectual property created by the consultant or their representative is owned by the client, or is held on trust by the consultant for the client. The customer is protected from any claims arising from the intellectual property by an indemnity from the consultant.
" created_timestamp: "2018-10-08 04:36:04.0" modified_timestamp: "2018-10-08 04:36:04.0" active: true created_by: 236 modified_by: 236 dcm_id: 271 url_slug: "Consultancy-agreement" meta_description: "Create a consultancy agreement with simple guidance from Rocket Lawyer. Put things on a formal footing when you engage a consultant or you\'re being engaged as a consultant to provide services. Try this sample contractor agreement template." time_to_complete: "15 minutes"
Whether you're engaging a consultant or you're being engaged as a consultant make sure you put things on a formal footing with this consultancy agreement. This simple consultant contract will make certain that both parties are clear on the services to be provided by the consultant as well as payment obligations. This consultancy contract will also protect you and your business on crucial issues such as ownership of intellectual property created by the consultant and data protection matters. A consultancy agreement is a contract between a self-employed person (consultant) and a customer requiring the consultants services. Consultancy services are wide ranging and include advice from experts in certain areas eg brand consulting or the services of an independent contractor, such as freelance designer. Rocket Lawyer's consultancy agreement sets out all the terms of the arrangement such as the amount of time a consultant will spend on the project, how much they will be paid and contains clauses on confidentiality and ownership of IP. This contract will ensure that both client and consultant are legally protected. Rocket Lawyer's consultancy agreement can be used for both consultants and contractors. A consultant provides expert knowledge in return for a fee. They tend to work in an advisory capacity and are usually some of the most knowledgeable people in their chosen field. Consultants tend to work in specialist industries, such as finance and technology and provide businesses with professional, expert advice. What are the consultant's obligations under this agreement? How is a consultants liability limited? How is the customer's confidential information protected under this agreement? This agreement specifies the types of confidential information the consultant may be exposed to, such as customer lists and business plans. A consultant is restricted from using, disclosing or allowing the use or disclosure of such information, without the clients prior written consent. The consultant must return or delete any confidential information when the agreement ends. The customer is also under the same obligation of confidentiality regarding the consultants confidential information. More than just a Consultancy agreement template, our step-by-step interview and guidance makes it easy to create your document. Easily create online, download, print and sign your free Consultancy agreement in minutes. This document is also sometimes called: Contractor agreement, Services agreement, Consultancy contract, Consulting services agreement and Consulting agreement.